What Wan Laisheng inherited most of the Kung fu in the Nature School is from Du Xinwu. The technique of attacking without any fixed rules and the natural and changeable combat spirit of the Nature School meet with the international free sparring combat technique. They are really the treasure of Chinese wushu. 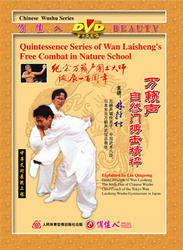 In this program, Lin Qingsong lists dozens of combat techniques in the Nature School, some of which attacks initially, some can turn passivity into initiative, some subdue the opponent by one form or several forms. We believe in the world of the prevailing free combat, these techniques will gain praise from the wushu lovers.